Four-year degree in business. Trained in hand-to-hand combat. This is the resume of the last mailman on Earth. It is the near future, and the modern world we knew has been overrun and destroyed by reanimated corpses who hunt humans for food. Mankind has retreated to small pockets of civilization and practically surrendered to the walking dead. But one man routinely leaves behind the safety and comfort to find the people and things we’ve long abandoned. He battles the elements. He battles his own brewing insanity. But mostly, he battles zombies. DJ used to be a Corporate Suit, but in this post-apocalyptic world he has become a mailman - one who takes on the ultra-dangerous task of going out into the "wild" to search for loved ones left behind, but usually only manages to bring back a few sentimental items, often including suicide letters. The job may be life threatening, but is not without it's perks. When a cure for the zombie bite is found DJ is volunteered to guard the goods being traded for the cure, and to retrieve it - yet just when it seems like things will be smooth, they go horribly wrong. 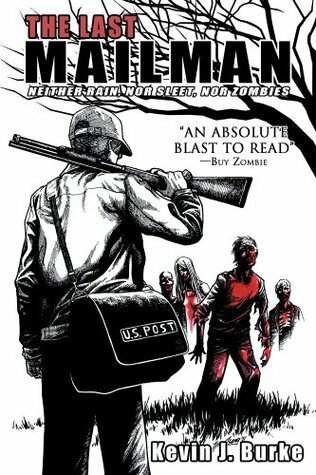 This is a gritty zombie story - a little dark maybe - but it has humor, and is a bit unique among the zombie stories I've read so I'm giving it a big thumbs up. Kevin J. Burke is an award-winning author*. Permuted Press is about to release his work, The Last Mailman: Neither Rain, Nor Sleet, Nor Zombies! as a trade paperback. He lives in upstate NY where he is hard at work on several other projects. *awards may have been less related to authoring and more related to grade school projects.